WV 59 -- dead or still alive? After driving WV 29 between US 50 and US 48, I think I have West Virginia's primary state route system clinched (I thought I had clinched it earlier this year, but forgot about that section of WV 29 until recently. Re: WV 59 -- dead or still alive? We do not include it on TM. I've driven it. There are regular county routes that are far better. Nor do you include WV 6, which is undeniably primary. Because it's unsigned (per Wikipedia). Very short, less than a mile long, most of it just a bridge over the Kanawha River, connecting US 60 to WV 61 in Montgomery. That's my point. WV 59 is unsigned, just like WV 6. I know. And it's inventoried as a state route, which it is unsigned as. Here in Florida, SR 557 is unsigned, being signed instead as CR 557. But SR 557 still exists. Of course, it really does not matter, because in WV, unlike most states, "county" is just a classification the WVDOH uses to mean, more or less, a lesser form of road, also under state maintenance. There are no county routes in the sense that an actual county department is responsible. So either a cartographer or a sign maker made a mistake. Given the condition of the road, my bet is the cartographer. The source document would be the Commissioner's Order, which describes every road in language similar to that used in deeds, and which are often used to resolve who is responsible disputes between the state and city (lots of city streets are unsigned county routes and thus DOH responsibility) but these are not indexed nor on line. This. Our general policy is to not include unsigned state routes. Of course, it really does not matter, because in WV, unlike most states, "county" is just a classification the WVDOH uses to mean, more or less, a lesser form of road, also under state maintenance. Any idea why West Virginia took/used the "county route" moniker for such routes instead of "Secondary Route" as is the general case in Virginia? Given the way West Virginia typically signs state primary routes, if this was a true state primary route, there would be lots of signage using the square WV 59 marker. Here, there's just the singular typical county route signage with the road name and the county route marker. Compare that to, say, Alt. WV 72, which is totally unsigned and doesn't even have a sign designating the road's name as you travel on either WV 72 or WV 26. Or the alternate route in Mt. Hope (either 16 or 61, I can't remember which), which is signed as Virginia Street but has no route markers. In the absence of any other definitive information, I'm going to consider this route NOT a part of the West Virginia primary system, and I hereby pronounce that system clinched in its entirety. I emailed Brent White, the WVDOT spokesman, about something a few weeks ago. I even sent it from my work address and referenced his involvement in the AASHTO Subcommittee on Transportation Communications to let him know I'm not just some random run-of-the-mill roadgeek, and that he and I had actually met personally in the past. He never replied. So I doubt another inquiry to him would produce any information. Nothing in there I could find points to anything about Route 59 though. WV used to have "real" county routes, maintained by county tax $$ using county employees (and inmates) until the Depression, when many counties were bankrupt and many taxpayers were as well. They passed a "tax limitation amendment" that, among other things, relieved couties of their road systems, thus freeing up county tax $$ (mostly the property tax) for everything else. Since the roads were already mapped and numbered, there was no real reason to change. Over the decades, of course, hundreds of additional CRs have been added, by either construction or various attempts to deal with so-called "orphan roads", which are roads that were constructed by the extractive industries for their workers and then just left in place with no repairs as times changed. Most of these eventually were "taken in" as CRs. I contacted WVDOH's Hardy County headquarters several years ago about this issue. 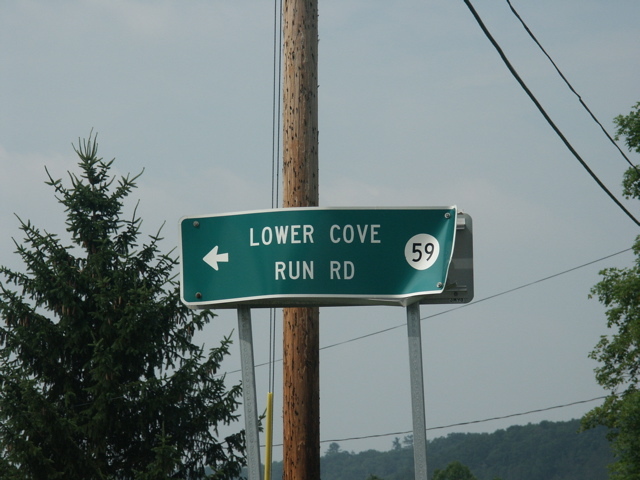 They indicated that it is officially still WV 59, a primary route. I imagine it's probably a case where nobody has ever bothered to prepare the paperwork to have it redesignated. Thank you for your inquiry regarding WV59 in Hardy County. WV59 was brought into the state system by Commissioner’s Order (CO) on 28 June 1929. A later CO Amendment in 1940 includes WV59, but simply restates the 1929 language. Our sign inventory indicates the sign at Lost City as using the county route symbology. Likewise, a check of Hardy County’s tax map also indicates it as a county route. There are no CO records supporting the change of WV59 to a county route. We hope this helps with your research. You got a reply? I'm amazed. I'm still waiting for a response to a message work email address about something. IMO, the WVDOH should sign it the way that their records sign it, not the way that the county thinks it should be signed. Especially in West Virginia, where the secondary ("county") highway network is owned and maintained by the state. Counties determine the road's name, but not its number or what system (state, county, HARP, Park & Forest) a road belongs in. That Hardy County's tax map shows this as CR 59 instead of WV 59 isn't particularly relevant. At some point, somebody screwed up at the WVDOH District 5 office. Either they failed to request a commissioner's order from Charleston to have the road redesignated as county instead of state, or the district traffic engineering specified the wrong signage. My guess is that Hardy County's tax maps come from how the road is signed in the field. WV 59 does not belong in WV's primary route system. It's not a road through traffic should be using. The WV section isn't great and its continuation as SR 691 in Virginia is a 1-lane gravel road on the side of a cliff. The best solution isn't to change the signage, it's to have a commissioner's order issued to redesignate it as a county route. My own hunch is that the CO was not requested when it should have. One question unanswered is when postings change from WV 59 to CR 59. CR 59 should definitely be secondary...Virginia demoted its side to a secondary route in 1949. WVDOT just sent me a copy of the CO decommissioning WV 59 to CR 59.